The Panda (shown) is Europe's top-selling minicar and No. 2 in sales at Fiat behind the Punto subcompact. 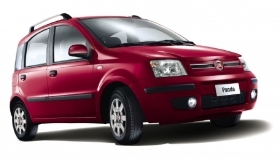 TYCHY, Poland – Fiat Group Automobiles S.p.A. is on schedule to begin production of the Panda successor in Italy in November and start sales of Europe's best-selling minicar in early 2012, a Fiat top executive told Automotive News Europe. "We are on track in refurbishing Pomigliano, which will become a truly state-of-the-art plant when it begins production in November," Fiat Group chief manufacturing officer Stefan Ketter told ANE on the sidelines of a plant visit here. Pomigliano currently makes Alfa Romeo cars. Fiat Group CEO Sergio Marchionne announced in April 2010 that the completely updated Pomigliano d'Arco plant in central Italy would start Panda output by late 2011. Meeting that goal, however, seemed unlike because of tense negotiations for a complex new labor deal at the plant, which has a history of labor unrest and the worst productivity level of Fiat's five Italian factories. Fiat threatened to keep production of the next Panda in Poland or move it to Serbia, if it didn't get the labor deal it sought. Had that happened, Pomigliano would have been shut down, Fiat said. Moving the new-generation Panda, which will debut at the Frankfurt auto show in September, to Pomigliano is part of Marchionne's so-called Fabbrica Italia (Italian factory) plan to boost Italian production to 1.4 million passenger cars in 2014, compared with 650,000 last year. It will also free up production at Fiat's factory here in Tychy, Poland, which currently builds the Panda along with the Fiat 500 and the Ford Ka minicars and will begin making the Lancia Ypsilon subcompact in April. Tychy is Fiat's largest and most productive factory in Europe. Tychy built 533,455 units last year, ranking it second within Fiat Group's global plants after the company's Belo Horizonte, Brazil, factory, which built nearly 700,000 units in 2010. Ketter confirmed it will take Fiat two months from Job 1 (the technical definition of production start) to the beginning of sales to customers, set to start in February 2012. To make domestic production profitable, Marchionne asked unions to increase efficiency by about 70 percent, switching to a three-shift, 280-workday year from the current two shifts and 235 workdays. Fiat's underutilized Pomigliano factory plays a crucial role in the CEO's Fabbrica Italia plan. By investing 800 million euros to make the new Panda in Pomigliano, Marchionne wants to see a tenfold improvement in the plant's output by 2014. Last year, the plant built about 30,000 units of four Alfa Romeo models, the 159 mid-sized sedan and wagon, plus the final units of the 147 compact hatchback and GT coupe. Both cars were discontinued at the end of 2010. Marchionne expects Pomigliano's output to rise to 270,000 to 300,000 units a year at full capacity because of the Panda's production there and the new labor deal. The current Panda, which was launched in late 2003, has been Europe's best-selling minicar since its first full year of sales, 2004, according to figures from market researcher JATO Dynamics. Fueled by scrapping incentives in Europe's five largest markets, Panda sales in Europe peaked at 299,992 units in 2009. Panda volumes declined 21 percent to 236,323 units last year.